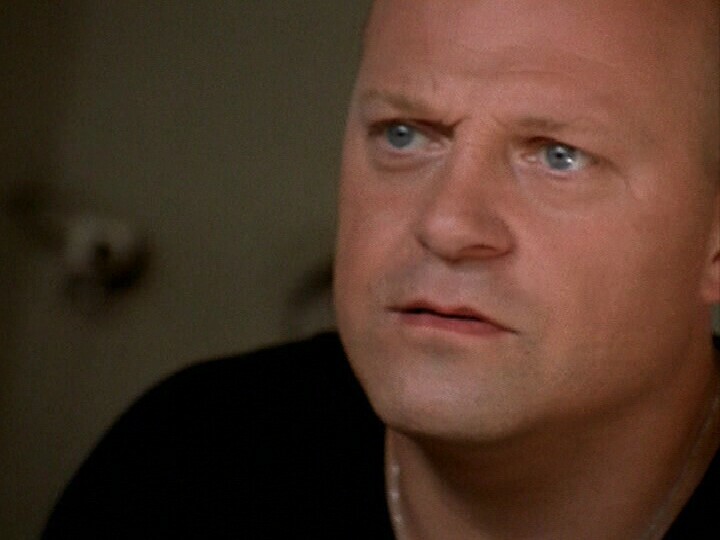 Separated at birth: Joe the Plumber and Vic Mackey from The Shield. This morning on CBS they had about half a dozen people named Joe or Jo from different occupations, and they compared each one's taxes under the Obama and the McCain plans. The one who came out best under McCain was "Joe the lawyer." He also happened to have the most annual income (surprise). The others came out best under Obama. Candace: Yeah, that figures. There's also a video going around that shows Dumbya in 2000 giving an almost identical speech about taxes. He had a "typical middle American worker" as a mascot, and he was using all these soundbites to show how his tax cuts would help this worker, and "my opponent" would raise his taxes. The video jumps back and forth between Bush's 2000 speech and McCain's debate speech; they're almost interchangeable. It's true! sal pointed out that he looks like Mr. Svenning from Mallrats as well. Joe the Plumber really is Joe Everyman! It's sad that all the people who use things paid for by tax dollars are so easily scared by that word. It's worse than Leatherface on steroids with six chainsaws. Randal: "It's sad that all the people who use things paid for by tax dollars are so easily scared by that word." I know, it's absurd. "Taxes are EVIL" as we're driving on a highway built with tax dollars, and drinking water and breathing air that have been cleaned up (somewhat) by those big meddlesome government bureaucrats. I keep telling me not to worry, his 15 seconds of fame will be over before we know it. Snave: Coming soon, a celebrity boxing match between Joe the Plumber and Joe Sixpack. I actually had a 'tard accuse me of being "stupid" for not "knowing" the documents related to good old Joe's wife beating was a "forgery." He said it was reminiscent of "the Obama campaign's smear campaign against Sarah Palin." I guess if you compare Sarahpoleon's YouTubes with the court documents online in Ohio, one could call it a "smear campaign." I think most folks would call it "historical reference." JR: Yeah, these wingtards use some twisted "reasoning." It's a smear campaign if you disagree with McPalin about the issues, or try to find information on Joe the Plumber, America's newest celebrity (for the next 15 minutes). But it's OK for wingnuts to use racial slurs against Obama or accuse him of being a militant Muslim, since after all he pals around with terrorists. Joe's a fairly common-looking type, all right. Here's another one. Joe the non-plumber plumber says he has parents and don't need no stinkin' Social Security. Since it's been revealed Joe hauled in $42,000 last year, I'm sure when the time comes he will be able to provide for his parents' every need for food, shelter, medical care, etc. But then Joe reveals he's not too well educated on these things, because SS isn't a government share-the-wealth program. It's money his parents have paid in that they will start getting back, as he will when he's old enough. Of course, he'll tell SS he don't need no stinking monthly checks from them. SW: Yeah, I can't believe all these people who think Social Security is just a giveaway for lazy people. Then they change their minds when they themselves are entitled to it. Sort of like politicians who rail against socialized medicine while they're on their way to the doctor's office (courtesy of the taxpayers). This whole thing with JTP is such a planned farce to bring Obama down. They keep trying so desperately: one brand of snake oil after the next. And what's funny is that they keep getting caught at their own game!! But the digbat nutjobs are the only ones who fall for it. Virgomonkey: Like you said, "one brand of snake oil after another." You'd think after this many failed attempts, the Right would get the idea and start trying something else besides slander attacks and creating phony "Joe Sixpack" caricatures. Or maybe this is all they're capable of doing, since they seem unable to campaign on the actual issues.